Both House and Office Removals between London and Belfast have really only become common place in the last couple of years. With Belfast having even become a tourist destination in recent times, and having such great infracture, Including three airports, withing easy reach of the city, as well as all the fast ferry routes that bring you close to the centre and Motorways that can get you to any part of the island within a couple of hours, with no traffic jams. And, being the second largest city in Ireland, Belfast also has lots of attractions, as well as the lively night life and friendly welcome ensuring that visitors are now deciding to Move to Belfast. Of all the places in Ireland, we still find that the most popular two destinations for our uk customers to move house are Dublin and Wicklow. Dublin being the capital I suppose is not surprisingly popular, but Wicklow has a lot of attractions too, such as the mountains, and of course the coast, and with the motorway opening up, it also is close enough to the city to easily commute. So many household names have relocated to Wicklow, from the Film and Music industry, and McCrorys Removals have had the pleasure of assisting in the removals of many of them in the past, including, fairly recently, the multi award winning, singer songwriter Kevin Godley, from Cream… discretion does however prevent us from disclosing …even the district they have moved to. It is a commonly held belief that Shamrock only grows in Ireland. Well, that may generally be the case, in the wild. But my relatives bought me some shamrock seeds, they were in fact in a compost growing kit, with the brand name of Chatsworth, and after about a week, sure enough there was some signs of seedlings appearing. At first they were just a single leaf…but…then, after a few more days, they split into the familiar three leaf shape. I have taken a photograph of them thriving on my kitchen window sill in Nottingham…..so for now, we can say that, yes, it appears that irish shamrocks grow in england. Legend has it that St. Patrick used the shamrock to illustrate the Concept of the Holy Trinity, and it has become so associated with Ireland, that, the Irish Government have in fact registered the shamrock as a Trade Mark, and many companies, including, the Irish Tourist Board, ‘Bord Failte’ Aer Lingus, and of Course McCrorys Removals use the shamrock symbol for branding. Hopefully our attempts at growing the shamrock outside Ireland will be short lived, and will only live indoors long enough to be worn on the next St Patricks day parade. If anyone was in any doubt about the welcome they might receive, if they consider moving to Ireland, the queens visit is a good guide to the fact that Ireland is a country with great historical interest, but also a forward looking people. Hundreds of thousands of people have moved house from the uk to Ireland, over the years, so, why not you? But, for the first time in the Reign of Queen Eliz 11 The English Monarch is to visit Ireland. We will, hopefully, be able to upload some relevant pictures of this event… and, perhaps, even manage to persuade some of our past customers to send us some of their own photos to upload to our site to share. 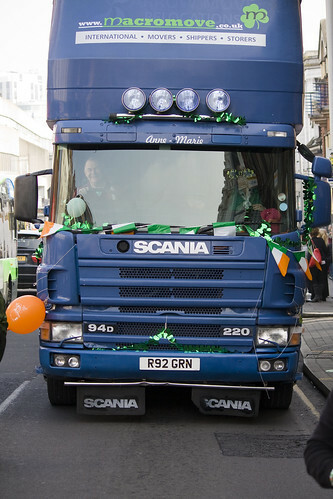 McCrorys are experts in moving people and their belongings for Ireland to the UK. For over 25 years we have been crossing the Irish Sea for our customers, and have over 1000 removals under our belts. Ireland to UK Removals is what we specialise in, so contact us today for a free home removals quote. One of our most popular requests is London to Dublin Removals. Therefore we are experts in ensuring jobs like this have costs kept to a minimum, meaning that we can pass these savings down to our customers. If you are moving from London to Dublin,or from Dublin to London, please contact us for a removal quote. As many of you will know, McCrorys Removals originated in Ireland. 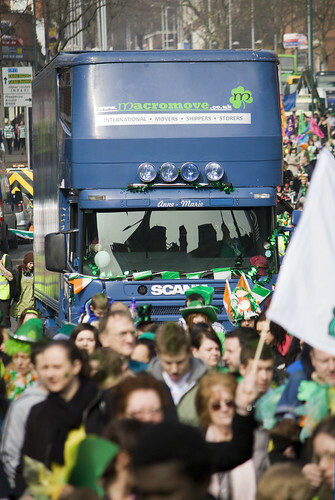 Each year we like to take part in the St Patrick’s Day parade in Nottingham and take the opportunity to decorate the lorry and join in the fun.